Rapid basin evaluation of the second most prospective, under-explored offshore basin in the world. The USGS estimates reserves of 13.6 bn bbl remain undeveloped in the Guyana Suriname basin. Frogtech’s Guyana-Suriname SEEBASE® Multi-client Study & GIS unlocks the secrets of the second most prospective, under explored offshore basin in the world through an integrated geophysical and geological study of basement and basin evolution of the Guyana-Suriname basin. The study covers the offshore exclusive economic zones of Trinidad, Venezuela, Guyana, Suriname and French Guiana as well as relevant onshore areas. The study includes a depth-to-basement model developed using Frogtech's industry-leading SEEBASE® workflow, providing the first regional interpretation of the basement of the Guyana-Suriname Basin, including identification and distribution of depocentres. An integration of the 3D basin geometry and accompanying MOHO Model highlights the regional crustal architecture and variations in crustal thickness at a much higher resolution than is available from published crustal models. Together, these center-piece elements of the study make the Guyana-Suriname SEEBASE® Multi-client Study & GIS a highly cost-effective tool for first-pass regional evaluation of the geology and prospectivity of this complex basin. 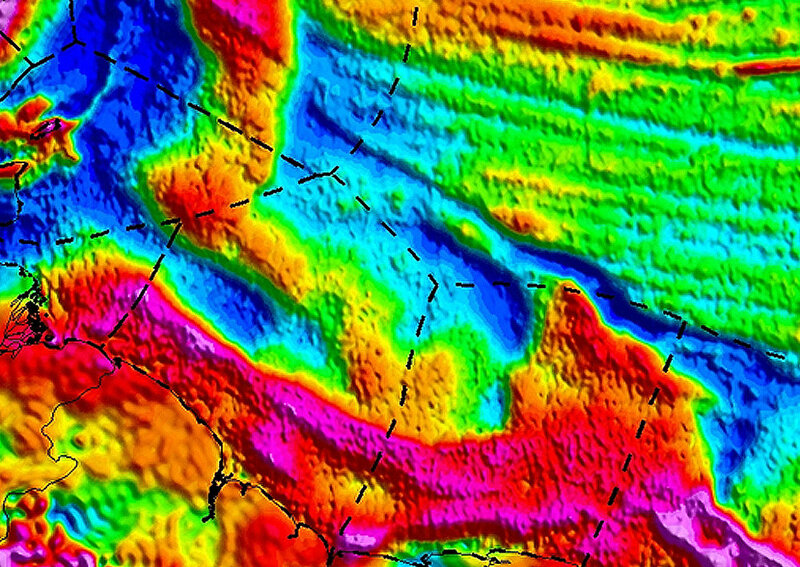 Using SEEBASE® in your workflow provides the basis for focusing future exploration and data acquisition strategies to reduce exploration risk and further underpin petroleum systems analysis. As a foundation dataset, the GIS data-pack supplied with the Guyana-Suriname SEEBASE® Multi-client Study & GIS is a valuable time saving, project ready resource. Through the option of adding proprietary constraining data, the model can be further improved beyond the resolution of the supplied depth-to-basement model, enabling exploration companies to maintain a proprietary model within their own project environment. Guyana-Suriname SEEBASE includes extensive project ready geo-referenced, integrated datasets that can be optionally further calibrated with client data ensuring improved insights and new ideas on basin architecture and evolution, as well as a better understanding of the extent of known and new depocentres. Guyana-Suriname Sediment thickness map detail. Complete coverage of STAATSOLIE - Open Door Invitation 2017, for Offshore Suriname open acreage (shown in aqua above), Source: STAATSSOLIE 2017. Guyana-Suriname SEEBASE includes Frogtech Geoscience's proprietary enhancements of Core Datasets including gravity (above), magnetics and DEM. Coverage extends significantly beyond the AOI. Detailed technostratigraphic charts support regional Guyana-Suriname tectonic events. Late Triassic to Early Jurassic volcanism of the Central Atlantic Magmatic Province (CAMP; 200-190 Ma). Early Jurassic (190-170 Ma) metamorphic core-complex formation in the thermally weakened crust in response to Pangea breakup. Middle to Late Jurassic hyperextension (170-155 Ma). Late Jurassic breakup between South America and the Bahamas. An overview of basin development through time that shows how the Early Jurassic basin history built the foundation for structural development of the basin for all subsequent basin-forming events, including control on the location of the Demerara Transform at the onset of Equatorial Atlantic spreading, and the geometry of the Demerara Plateau. A new regional depth-to-basement SEEBASE® grid, consistent with open-file seismic and well data, as well as magnetic depth and forward gravity models. This represents a significant step forward in understanding the geometry of the deep basin system. Basement and sediment thickness maps, together with plate reconstructions, providing constraints to better predict the deposition of source rocks associated with the rift and early post-rift phases in both Jurassic and Cretaceous time. Insights into how the basement topography in the deep-water basin plays an important role in localising basin floor fans. A regional analysis of basement terrane types, including origin, age, composition and rheology, provides key insights into basement evolution and response to successive regional tectonic events. A geologically-controlled regional model for basement-derived heat flow involving a much wider distribution of the extent of continental crust in the basement than all previous models, and which is consistent with measured geothermal gradient values. Eight plate reconstructions using the newly revised Guyana-Suriname terranes show the relative position of the Guyana-Suriname Basin at the ultimate tip of the propagating Central Atlantic. Each reconstruction was undertaken using FROGNet™ – FROGTECH Geoscience’s own rigid plate reconstruction model. General plate models are presented in the report, however FROGTECH Geoscience can undertake more detailed work on the FROGNet™ Plate model to test client models. Basement Geology: A detailed analysis and description of basement terranes including age, composition and fabric. Guyana-Suriname SEEBASE depth-to-basement model, shown in 3D oblique view. Each SEEBASE study is designed to be project ready. The Guyana-Suriname SEEBASE Study and GIS is supplied as a fully integrated geophysical and geological study of basement and basin evolution at a regional scale using public domain data-sets enhanced using Frogtech Geoscience proprietary processing. The SEEBASE model of the 3D depth and geometry of the basement surface provides the first commercially available seamless interpretation of crystalline basement and provides significant new insights into the distribution of depocentres. The study also presents a regional tectonic synthesis and interpretation that includes descriptions of basement terranes, Frogtech Geoscience plate reconstruction models, basement composition, and calculations for basement-derived heat flow. The integrated evaluation of the SEEBASE surface and accompanying Moho model highlights both the regional crustal architecture and variations in crustal thickness at a much higher resolution than available from published crustal models. These centre-piece features, along with other deliverables, make the Guyana-Suriname SEEBASE Lite Study and GIS a cost-effective regional evaluation tool that gives a first-pass perspective on the geology and regional prospectivity of this complex area providing a basis for focusing future exploration and data acquisition strategies to reduce exploration risk and underpin petroleum systems analysis. Fast-track your exploration: Rapid evaluation of depth-to-basement, sediment thickness and integrated structural analysis allows you to locate prime areas to target data acquisition and exploration, particularly in areas of ambiguous, sparse or no data. De-risk your exploration: An uninterrupted view of basement depth and topography overcomes challenges of poor sub-salt, sub-basalt and deep sea imaging in seismic. Gain a competitive advantage exploring frontier regions: Understand the continuity of your undrilled or target structures within the regional depth-to-basement structural framework across the Central Atlantic conjugate margins. Leverage your knowledge and data assets: by integrating new insights from basement terranes and lithological mapping, plate reconstructions, structural and paleogeographic analyses, sediment and basement thickness, crustal stretching and heat flow. Reduce modelling uncertainties: in basin and maturity studies with full-coverage models of present-day basement heat production and heat flow from basement composition, basement thickness and transient thermal events. Benefit from a scalable solution: with a SEEBASE® that is applicable from basin- to permit-scale studies. Detailed basement fault maps form part of a tectonic evolution model. Heat flow maps reveal Guyana-Suriname crustal-scale architecture highlighted by the profiles of the SEEBASE depth-to-basement model.